Infographics’ format and economy of words make infographics engaging and accessible to children, reluctant readers, visual learners, and English Language Learners. As infographics contain multiple layers of information, they are a challenging medium for students to practice inferences and interpretation. Lee & Low Books’ infographic series on the diversity gap in major spheres of influence is a valuable vehicle to build students’ visual literacy skills and understanding of diversity. The following discussion questions and suggested activities were created based on the Diversity Gap in the Academy Awards infographic, but these can be applied to the rest of the series. What patterns do you see? What trends do you see? How are the different charts related? What is the central idea of this infographic? How do the words, phrases, and visuals interact to affirm the central idea? 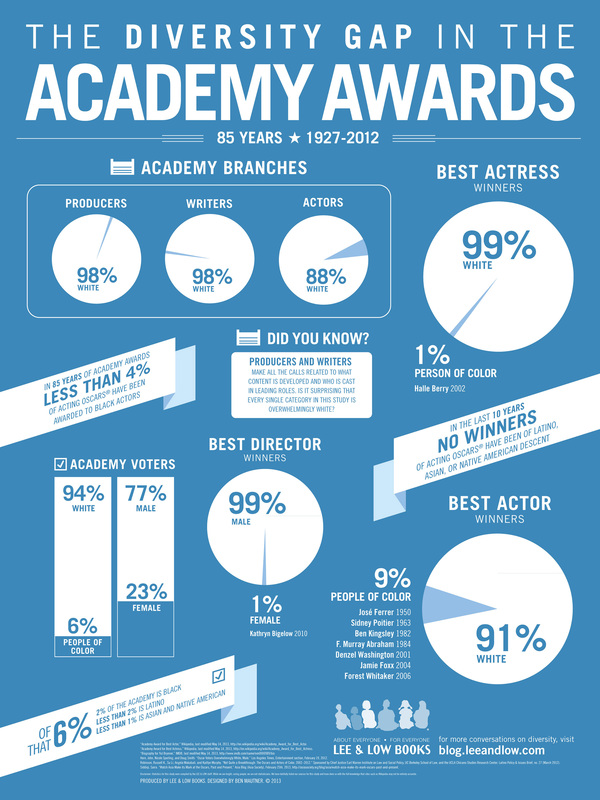 Based on the infographic, what does “diversity gap” mean in terms of the Academy Awards? What might the author’s purpose be in choosing this medium to convey the central idea (to shame, inspire, shock, etc. )?